A domestic violence suspect bit two deputies during a fight early Monday, leaving one of the deputies with a severed finger, according to the Washington County (OR) Sheriff's Office. 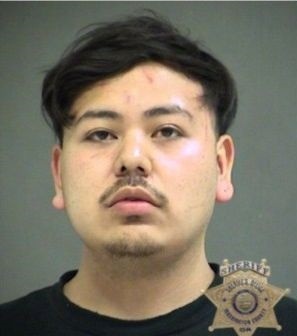 Deputies were called to an Aloha-area apartment complex on a report that Erik Rodriguez-Reyes was assaulting his pregnant girlfriend, the agency said in a news release. Rodriguez-Reyes and his father were later arrested. The girlfriend suffered minor injuries, reports the Oregonian. Several people were "uncooperative" when deputies showed up, and "started a physical confrontation" with the responders, according to the sheriff's office. Rodriguez-Reyes bit two deputies during a fight, severing the tip of one of the deputies' index fingers, the agency said. The injured deputy, who wasn't publicly identified, was taken to a hospital for treatment.